Kazan Cathedral or Kazanskiy Kafedralniy Sobor, also known as the Cathedral of Our Lady of Kazan, is a cathedral of the Russian Orthodox Church on the Nevsky Prospekt in St. Petersburg. 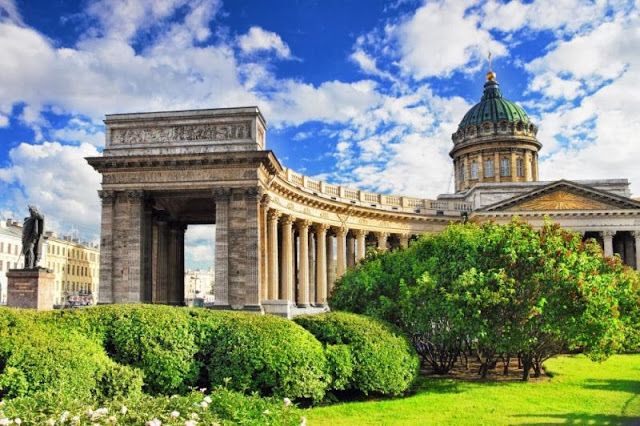 Kazan Cathedral, constructed between 1801 and 1811 by the architect Andrei Voronikhin, was built to an enormous scale and boasts an impressive stone colonnade, encircling a small garden and central fountain. The cathedral was inspired by the Basilica of St. Peter’s in Rome and was intended to be the country’s main Orthodox Church.